The Zoo is pleased to announce the birth of black and white Holstein calf, Lacey! Lacey was born on August 3 to mom, Darcy, and dad, Maui. Weighing in at approximately 89 pounds at birth, Lacey is a healthy black and white female Holstein calf, with a nearly all white coat! Lacey has been drinking primarily milk, roughly 16 pints per day and has access to alfalfa hay. She will soon be offered grain. Lacey is a sweet and playful calf who enjoys interacting with the public. Lacey is a sweet and playful youngster who enjoys being outside and interacting with the public. Currently Lacey is too small to be with the other cows, although she does get to interact with her teenage neighbor, Jovie, who was born in December 2016. Holstein cows make up roughly 90 percent of over 9 million dairy cows in the United States. The average cow produces around 9 gallons of milk daily during lactation. As such, Holstein cows are known for their impressive milk production. Lacey is currently on exhibit in the calf hutch and will remain on exhibit throughout the winter, weather permitting. By winter, Lacey will have access to the barn and can then decide whether to be inside or outside. 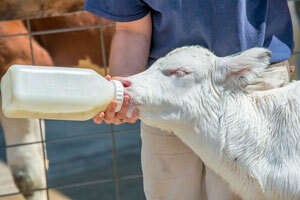 Stop by the Northwestern Mutual Family Farm to say hello to the newest and sweetest addition to the farm!